…you start wondering whether you could possibly do a last minute Pennsic War. No, I’m not that insane. Attending Pennsic takes Proper Prior Pre-Planning, and I’m not really in condition to tramp the hilly roads, eating dust all day and breathing campfire smoke all night. But the beginning of August cometh, and Cooper’s Lake would be a very fine destination. – you overhear the 10-year-old at the next picnic table quoting Macbeth… accurately. – a sideless surcoat is the sexiest thing in your closet. – you provision all the props and costumes for a school production of a medieval play from your closet. – you have period garments for a black-tie event, but no mundane ones. – bad heraldry and/or costuming has ruined an otherwise decent movie for you. – the axe you’re using to chop wood was one you made yourself. – you’re a burly guy who looks like a Hell’s Angel, but you do embroidery in public. – at a formal dinner party, you politely grab your sleeve to keep it from dropping in the food, only to realize you’re wearing a suit. – during a conversation, you avoid using the other person’s name, not because you don’t know it, but because you can’t pronounce it. – you return to work after a weekend event, only to find you left all your money in your belt pouch. – your teddy bear has better garb than you do. – your garb closet is bigger than your clothes closet and the clothes are in better condition. – you watch the old replay of the Coronation of Queen Elisabeth II and you recognize people’s ranks by the coronets they are wearing. – while watching the crowning of Queen Elisabeth II, you all of a sudden tell your lady, “We could use that stuff at Our Coronation”. -your kid gets a cardboard punch out castle and you take it away from him and put it together yourself, point out the flaws in the architecture, and based on your assessment of the flaws in the architecture, figure out how you and your household could, hypothetically capture it if it was a real castle. – your idea of a sack lunch is mince-meat pie, cold mulled cider and wafers left over from the feast the week-end before. – your hobby takes more of your time than your job. If this sort of thing sounds fun…well, that’s because it is! When the SCA’s good, it is very, very good. It does have its bad sides, though, as some of the above lines may have disclosed. Screwtape has written a few letters about that which have been published by Viscount Galen. You can learn more about the SCA at sca.org. Thou Must Be Joking Me. Second, I do support those who choose to step away from the world and pick out a higher standard. If you want to wear Wholesomewear, then yay for you. It’s all very well to compare swimming suits to underwear; but when it comes right down to it, the semantics of a garment matter just as much as its actual form. Many men would be embarrassed to stand in front of strangers in their boxer shorts. Very few would be embarrassed to do the same thing in swimtrunks. Both garments cover similar amounts of skin, but they are made for different purposes. Everyone knows that swimtrunks are not intimate garments, but public ones. Every maker of swimtrunks designs them with liners to preserve men’s modesty and the trunks’ opaqueness. Similarly, women who would be embarrassed to be seen in front of strangers in a regular bra aren’t embarrassed by a sports bra, because it’s designed for a firm and flattening hold and total opaqueness. Same thing for a swimsuit. It’s not a single layer (unless it’s a really cheap suit), it’s not transparent (ditto), and it’s not intimate. Conversely, if I climb out of my fitted business suit, hose and heels and change into a long-sleeved, ankle-length thick woolly bulky nightgown and huge slippers, I feel that I am less covered than I’d been during the day, even though the square footage of skin exposed is far less. If someone should come to my door while I am thus in deshabille, I must put on a robe to maintain my modesty. The semantics of the clothing trumps their actual appearance. Modesty is restraint, not ostentatious nonconformism or conformism. Modesty is acting naturally, not teasingly. Modesty is just plain decency. It’s a virtue of minimalism, and if you have to think about it too much, you’re probably mistaking shyness or personal style for modesty. I’ve been in the SCA (medieval recreation group), and I’ve seen women clothed in voluminous garments from head to foot, with sleeves that covered even the hands, having no trouble at all being immodest. I’ve seen women wearing burqa doing the same. (And not just in play, either. There’s a segment of the SCA that’s a strong family group; and then there’s all the unattached college kids, who are often out for other things. As the song says, “If ye cannae get laid at Pennsic War, ye cannae get laid at all.”) So I’m hardly convinced that summer’s bare arms and legs are to blame for the sins of modern society. This site‘s got a pretty decent “outfit test”. (It’s pretty much what your mom taught you about finding clothes that fit.) However, its claim that the Church never had teachings about clothing until the twentieth century…is wrong. Can you say “sumptuary law”? As for other sorts of immodesty, there were edicts handed down about all sorts of pre-modern fashion crimes. Lessee…off the top of my head…the pointy shoes called poulaines, when the points got stupidly long. (Note the “under pain of cursing by the clergy”.) Horned women’s headdresses. The infamous sideless surcoat, or “Gates of Hell”. 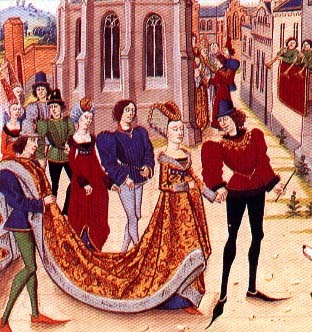 (Check out the lady on the side who’s wearing a gray surcoat trimmed in white. As you can see, the tightly laced-up kirtle underneath reveals the lady’s figure in detail.) So if we were wearing medieval gowns today, we’d still see women posing; they’d just pose like this. However, if folks want to be concerned about modesty, I suggest they start with the Scotsmen. Those immodest Celtic barbarians not only wear kilts that bare their knees, but also let it be known that some go bare beneath them. Now that’s a custom bent on inspiring lascivious thoughts! But if we do go back to total arm and leg coverage and nothing but skirts, I ain’t wearin’ hose or slips ever again. Give me a nice comfy shift or chemise any day…. My Auntie Bun passed away this morning and went to join her husband. She’s my great aunt, and she had a good long life; but I wish she could have stayed with us a little longer. She was my Grandma O’Brien’s twin. They got along the way sisters do — with a bit of wrangling. When she moved out of her house a few years ago, I remember the bit of controversy caused when Grandma found out that Auntie Bun had had certain of their mother’s things all those years…. But both of them teamed up against their older sister, a domineering woman who’s been pretty lonely since her kids moved away and her own health’s turned frail. Maybe Auntie Bun’s death will bring the surviving sisters closer together. I hope so. She had a good life. She and her husband lived in Celina, in a lovely house about a block away from the shores of Grand Lake St. Mary’s. They had a “woody” boat that looked a lot like the ones that chased Indiana Jones in Venice. Auntie Bun had many friends and participated in a lot of community activities. She also painted some pretty nice pictures in her time…but in her final years, her hands shook and she went almost blind. She was in pain much of the time, because she was so determined not to depend on drugs. Eventually this was discovered and her prescription changed to a dose that allowed her more useful hours in the day, but her strength had already been sapped. Now her fight is over. Grant her eternal rest, O Lord, and may perpetual light shine upon her. May she share the blessed vision of Your infinite beauty, and create reflections of it to Your glory. Amen. There’s a long essay that’s been passed around since shortly after 9/11, which you can read (among other places) over at Emigre with Digital Cluebat. Here’s the parts I found interesting, with a little comment by me in italics. In related news, a vintage film find. Heh. Brand New Really Old Elgar! It seems that Manfred Mann bought a box of stuff and came up with parts from his old choir, and some hymns he’d written then. So it seemed like a good idea to release an Elgar choir album! You apparently can’t buy it on amazon.com, but amazon.co.uk will set you up with some brand new old Catholic hymns. Cool, eh? Stargate Atlantis: Scottish Clan Show! I realized last night that this is the first show I’ve watched on which most of the main characters can claim a tartan. There’s Dr. McKay (of course), Weir, and Sheppard (Shepherd). Ironically, the guy with the Scottish accent is named Dr. Beckett, so I guess we’ll have to hope he lets us know his mother’s maiden name sometime. Just to increase the Celtic atmosphere, the black guy is named Aiden Ford. Fits right in with Jack O’Neill. Yup, there’s Celts everywhere! Dr. McCoy, Star Trek, is part of the MacKay clan, too! But it’s too late to take it back now. Mwhahaha! Especially when the head female’s name is Elizabeth!